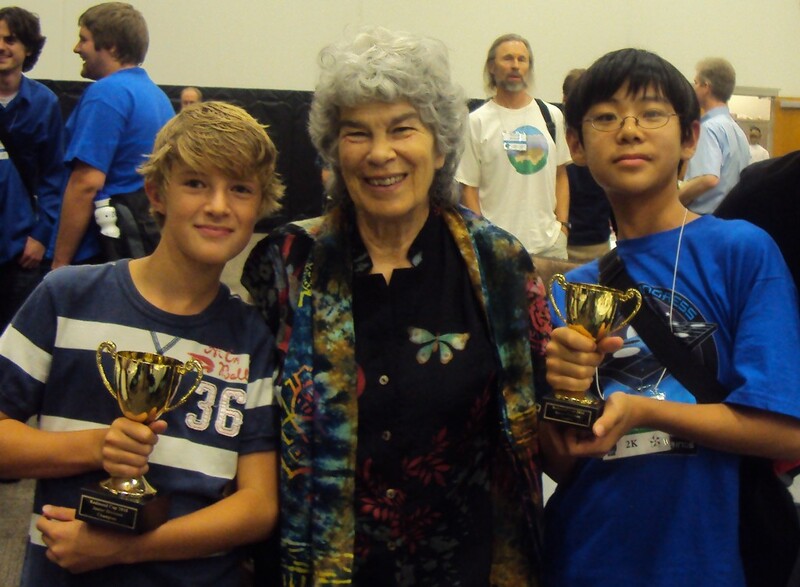 Oliver Wolf 2d, age 11, won the Junior Division of the Redmond Cup at the recently concluded US Go Congress. His opponent, Henry Zhang 1d, also 11, took second place. Wolf won the first round match, held Aug. 2, but Zhang rallied to come from behind in round 2, winning by 3.5 points. The decisive match was held on Aug. 5, with Wolf winning the game, and the title of Redmond Champion. Both boys received a special honor when None Redmond, founder of the Redmond Cup, and tireless youth go advocate for decades, presented the trophies in person at the final awards banquet at the Go Congress. The boys also won $350 for first place, and $250 for second, as well as a free trip to the Go Congress to compete. All three matches were broadcast live on KGS, and the sgf files are available online. Paul Barchilon, E-J Youth Editor. Photo by Ling Shan; from left to right: Oliver Wolf , None Redmond, Henry Zhang.